Gubner, Noah R. Thrul, Johannes Kelly, Oona A. and Ramo, Danielle E. 2018. Young adults report increased pleasure from smoking cigarettes when drinking alcohol but not when using marijuana. Addiction Research & Theory, Vol. 26, Issue. 1, p. 71. Suckling, John and Nestor, Liam J. 2017. The neurobiology of addiction: the perspective from magnetic resonance imaging present and future. Addiction, Vol. 112, Issue. 2, p. 360. Fischer, Benedikt Murphy, Yoko Kurdyak, Paul and Goldner, Elliot M. 2016. Depression – A major but neglected consequence contributing to the health toll from prescription opioids?. Psychiatry Research, Vol. 243, Issue. , p. 331. Teuns, Greet 2015. Nonclinical Assessment of Abuse Potential for New Pharmaceuticals. p. 101. Thomas, Naveen and Pantelis, Christos 2015. The Encyclopedia of Clinical Psychology. p. 1. Choi, Hye Duck and Shin, Wan Gyoon 2015. Association between catechol-O-methyltransferase (COMT) Val/Met genotype and smoking cessation treatment with nicotine: a meta-analysis. Pharmacogenomics, Vol. 16, Issue. 16, p. 1879. Reith, W. and Kulikovski, J. 2015. Diffusionsbildung und psychiatrische Erkrankungen. Der Radiologe, Vol. 55, Issue. 9, p. 782. Cohen-Barak, Orit Wildeman, Jacqueline van de Wetering, Jeroen Hettinga, Judith Schuilenga-Hut, Petra Gross, Aviva Clark, Shane Bassan, Merav Gilgun-Sherki, Yossi Mendzelevski, Boaz and Spiegelstein, Ofer 2015. Safety, pharmacokinetics, and pharmacodynamics of TV-1380, a novel mutated butyrylcholinesterase treatment for cocaine addiction, after single and multiple intramuscular injections in healthy subjects. The Journal of Clinical Pharmacology, Vol. 55, Issue. 5, p. 573. Mann, Karl Vollstädt-Klein, Sabine Reinhard, Iris Leménager, Tagrid Fauth-Bühler, Mira Hermann, Derik Hoffmann, Sabine Zimmermann, Ulrich S. Kiefer, Falk Heinz, Andreas and Smolka, Michael N. 2014. Predicting Naltrexone Response in Alcohol-Dependent Patients: The Contribution of Functional Magnetic Resonance Imaging. Alcoholism: Clinical and Experimental Research, Vol. 38, Issue. 11, p. 2754. Chatterjee, Biswadip Quraishi, Rizwana and Jain, Raka 2014. Sociodemographic and Drug Use Characteristics of Treatment-seeking Cannabis Users at a Tertiary Care Center in India. Addictive Disorders & Their Treatment, Vol. 13, Issue. 3, p. 110. Klimas, J. Cullen, W. and Field, C.-A. 2014. Problem alcohol use among problem drug users: development and content of clinical guidelines for general practice. Irish Journal of Medical Science, Vol. 183, Issue. 1, p. 89. Gurvich, Eugenia M. Kenna, George A. and Leggio, Lorenzo 2013. Use of Novel Technology-Based Techniques to Improve Alcohol-Related Outcomes in Clinical Trials. Alcohol and Alcoholism, Vol. 48, Issue. 6, p. 712. Páleníček, Tomáš Fujáková, Michaela Brunovský, Martin Horáček, Jiří Gorman, Ingmar Balíková, Marie Rambousek, Lukáš Syslová, Kamila Kačer, Petr Zach, Petr Bubeníková-Valešová, Věra Tylš, Filip Kubešová, Anna Puskarčíková, Jana and Höschl, Cyril 2013. Behavioral, neurochemical and pharmaco-EEG profiles of the psychedelic drug 4-bromo-2,5-dimethoxyphenethylamine (2C-B) in rats. Psychopharmacology, Vol. 225, Issue. 1, p. 75. Doran, Neal Schweizer, C. Amanda Myers, Mark G. and Greenwood, Tiffany A. 2013. A Prospective Study of the Effects of theDRD2/ANKK1TaqIA Polymorphism and Impulsivity on Smoking Initiation. Substance Use & Misuse, Vol. 48, Issue. 1-2, p. 106. Unseld, Matthias Dworschak, Giselle Tran, Ulrich S. Plener, Paul L. Erfurth, Andreas Walter, Henriette Lesch, Otto-Michael and Kapusta, Nestor D. 2012. The concept of temperament in psychoactive substance use among college students. Journal of Affective Disorders, Vol. 141, Issue. 2-3, p. 324. Celorrio, David Bujanda, Luis Caso, Carlos Landabaso, Miguel Oria, Juan Carlos Ogando, Javier and de Pancorbo, Marian M. 2012. A comparison of Val81Met and other polymorphisms of alcohol metabolising genes in patients and controls in Northern Spain. Alcohol, Vol. 46, Issue. 5, p. 427. Kensche, Maria Heinz, Andreas and Kienast, Thorsten 2012. Akuttherapie der Alkoholabhängigkeit. DNP - Der Neurologe und Psychiater, Vol. 13, Issue. 9, p. 68. Mattioli, Laura and Perfumi, Marina 2011. Effects of a Rhodiola rosea L. extract on acquisition and expression of morphine tolerance and dependence in mice. Journal of Psychopharmacology, Vol. 25, Issue. 3, p. 411. Kensche, M. Heinz, A. and Kienast, T. 2010. Bildgebung in der Diagnostik der Alkoholabhängigkeit. Bundesgesundheitsblatt - Gesundheitsforschung - Gesundheitsschutz, Vol. 53, Issue. 4, p. 326. Ameri, A. (1999) The effects of cannabinoids on the brain. Progress in Neurobiology, 58, 315–348. Ascher, J. A., Cole, J. O., Colin, J. N., et al (1995) Bupropion: a review of its mechanism of antidepressant activity. Journal of Clinical Psychiatry, 56, 395–401. Ashton, C. H. (2001) Pharmacology and effects of cannabis: a brief review. British Journal of Psychiatry, 178, 101–106. Bisaga, A., Comer, S. D., Ward, A. S., et al (2001) The NMDA antagonist memantine attenuates the expression of opioid physical dependence in humans. Psychopharmacology (Berl), 157, 1–10. Boot, B. P., McGregor, I. S. & Hall, W. (2000) MDMA (Ecstasy) neurotoxicity: assessing and communicating the risks. Lancet, 355, 1818–1821. Chiamulera, C., Epping-Jordan, M. P., Zocchi, A., et al (2001) Reinforcing and locomotor stimulant effects of cocaine are absent in mGluR5 null mutant mice. Nature Neuroscience, 4, 873–874. Dahchour, A. & De Witte, P. (2000) Ethanol and amino acids in the central nervous system: assessment of the pharmacological actions of acamprosate. Progress in Neurobiology, 60, 343–362. Herz, A. (1997) Endogenous opioid systems and alcohol addiction. Psychopharmacology, 129, 99–111. Jorenby, D. E., Leischow, S. J., Nides, M. A., et al (1999) A controlled trial of sustained-release bupropion, a nicotine patch, or both for smoking cessation. New England Journal of Medicine, 340, 685–691. Kieffer, B. L. (1999) Opioids: first lessons from knockout mice. Trends in Pharmacological Sciences, 20, 19–26. Koob, G. F. & Le Moal, M. (2001) Drug addiction, dysregulation of reward, and allostastis. Neuropsychopharmacology, 24, 97–129. Ledent, C., Valverde, O., Cossu, G., et al (1999) Unresponsiveness to cannabinoids and reduced addictive effects of opiates in CBI receptor knockout mice. Science, 283, 401–404. Louk, J. M. J., Vanderschuren, L. J. & Kalivas, P. W. (2000) Alterations in dopaminergic and glutamatergic transmission in the induction and expression of behavioral sensitization: a critical review of preclinical studies. Psychopharmacology (Berl), 151, 99–120. Maldonado, R., Saiardi, A., Valverde, O., et al (1997) Absence of opiate rewarding effects in mice lacking dopamine D2 receptors. Nature, 388, 586–589. Manzanares, J., Corchero, J., Romero, J., et al (1999) Pharmacological and biochemical interactions between opioids and cannabinoids. Trends in Pharmacological Sciences, 20, 287–294. Martin, M., Ledent, C., Parmentier, M., et al (2000) Cocaine, but not morphine, induces conditioned place preference and sensitization to locomotor responses in CBI knockout mice. European Journal of Neuroscience, 12, 4038–4046. Nicholson, K. L. & Balster, R. L. (2001) GHB: a new and novel drug of abuse. Drug and Alcohol Dependence, 63, 1–22. Nutt, D. (1993) Neurochemistry of drugs other than alcohol. Current Opinion in Psychiatry, 6, 395–402. Nutt, D. (1999) Alcohol and the brain. Pharmacological insights for psychiatrists. British Journal of Psychiatry, 175, 114–119. Nutt, D. & Malizia, A. L. (2001) New insights into the role of the GABAA–benzodiazepine receptor in psychiatric disorder. British Journal of Psychiatry, 179, 390–396. Pilla, M., Perachon, S., Sautel, F., et al (1999) Selective inhibition of cocaine-seeking behaviour by a partial dopamine D3 receptor agonist. Nature, 400, 371–375. Reneman, L., Lavalaye, J., Schmand, B., et al (2001) Cortical serotonin transporter density and verbal memory in individuals who stopped using 3,4-methylenedioxymethamphetamine (MDMA or “ecstasy”): preliminary findings. Archives of General Psychiatry, 58, 901–906. Rinaldi-Carmona, M., Barth, F., Heaulme, M., et al (1995) Biochemical and pharmacological characterisation of SR141716A, the first potent and selective brain cannabinoid receptor antagonist. Life Sciences, 56, 1941–1947. Risinger, F. O., Freeman, P. A., Rubinstein, M., et al (2000) Lack of operant ethanol self-administration in dopamine D2 receptor knockout mice. Psychopharmacology (Berl), 152, 343–350. Schultz, W. (2001) Reward signaling by dopamine neurons. Neuroscientist, 7, 293–302. Semple, D. M., Ebmeier, K. P., Glabus, M. F., et al (1999) Reduced in vivo binding to the serotonin transporter in the cerebral cortex of MDMA (‘ecstasy’) users. British Journal of Psychiatry, 175, 63–69. Strang, J., Bearn, J. 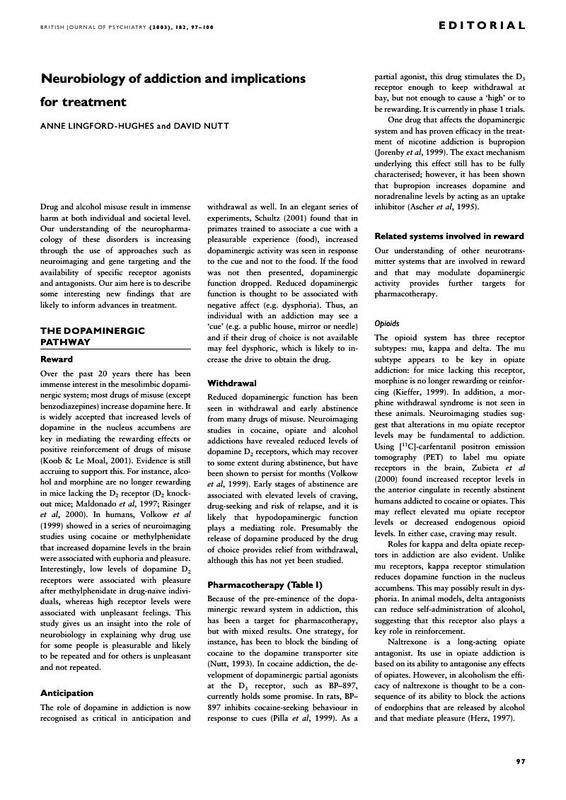 & Gossop, M. (1999) Lofexidine for opiate detoxification: review of recent randomised and open controlled trials. American Journal on Addictions, 8, 337–348. Volkow, N. D., Fowler, J. S. & Wang, G. J. (1999) Imaging studies on the role of dopamine in cocaine reinforcement and addiction in humans. Journal of Psychopharmacology, 13, 337–345. Wolf, M. E. (1998) The role of excitatory amino acids in behavioral sensitization to psychomotor stimulants. Progress in Neurobiology, 54, 679–720. Zubieta, J., Greenwald, M. K., Lombardi, U., et al (2000) Buprenorphine-induced changes in mu-opioid receptor availability in male heroin-dependent volunteers: a preliminary study. Neuropsychopharmacology, 23, 326–334.